StoreYa.com is a leading F-commerce platform designed for automatically importing web stores into Facebook, fully customizing them to fit both the Facebook arena and the original store look & feel. We pride ourselves in being the first ‘by the merchants for the merchants’ F-commerce platform, providing a way to discover new products in the Facebook ecosystem. Our solutions are designed to take full advantage of Facebook’s social features, including like, comment and our Cross-Platform share box. Providing the merchants with as many tools as possible for gaining more fans, purchases and data. One click import web-stores into Facebook, working seamlessly with Magento and other major e-Commerce platforms, Targeting potential new customers inside Facebook, Turning e-Commerce into F-commerce. 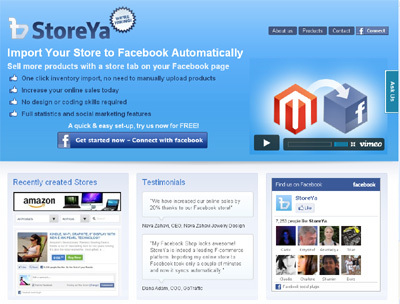 Using StoreYa you can import your web store with thousands of products in a few minutes, a complete automatic import. No design or development skills are required.